Now that the coats and gloves are out of their summer hibernation you may need to give some extra thought to your pets in cold weather. Animals with diabetes and other health issues can be particularly susceptible to the change in weather. Pointer may be shivering. Shorthaired dogs simply don’t have the same advantage. 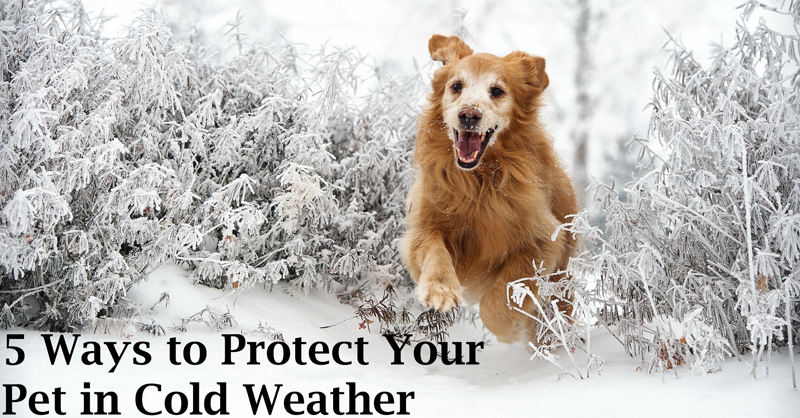 You can keep your pet warm with a coat, blanket or vest. A waterproof one will keep them warm and dry on those wet, dreary days. Shorthaired dogs will also be happiest with shorter walks when it’s really cold outside. 2—Give ‘em shelter – While many dogs will be prefer to be inside during the winter, the cold weather breeds (and some cats) will want to enjoy the snow more than you. If your pets will be outside for extended periods, provide them with a dog house or a crate on the porch. Add a blanket or towel for comfort and warmth. Of course, check on them often and don’t leave them outside in freezing weather when you’ll be away for hours. Pets can develop frostbite and hypothermia if they get too cold. 3—Protect them from ice/snow melters – The chemicals used to melt snow and ice in driveways and on sidewalks are good for preventing slips, but they can be harmful to your pets. Be sure to rinse or wipe your pet’s paws after a walk. Otherwise, they’ll lick the chemicals off, causing inflammation and upset tummies. One way to clean them when you come in from a walk is to use a rimmed cookie sheet by the door. Fill it with warm water and have them step in it, or place their paws in one at a time. This will loosen any ice crystals that may have gotten lodged in their paws and warm their feet up. Wipe them with a towel afterwards. 4—Lock up Antifreeze – Antifreeze tastes sweet to dogs and cats but it can be deadly. Keep antifreeze locked up and far out of the reach of curious pets. 5—Play inside – When the “wintry mix” is into its 3rd day, or your pet isn’t one who enjoys the cold, warm up inside. A rollicking game of “hide and seek” will warm you both up. Just make sure you take a few minutes to move delicate furniture or breakables out of the way. 2) Give ‘em shelter – While many dogs will be prefer to be inside during the winter, the cold weather breeds (and some cats) will want to enjoy the snow more than you. If your pets will be outside for extended periods, provide them with a dog house or a crate on the porch. Add a blanket or towel for comfort and warmth. Of course, check on them often and don’t leave them outside in freezing weather when you’ll be away for hours. Pets can develop frostbite and hypothermia if they get too cold. 3) Protect them from ice/snow melters – The chemicals used to melt snow and ice in driveways and on sidewalks are good for preventing slips, but they can be harmful to your pets. Be sure to rinse or wipe your pet’s paws after a walk. Otherwise, they’ll lick the chemicals off, causing inflammation and upset tummies. 4) Lock up Antifreeze – Antifreeze tastes sweet to dogs and cats but it can be deadly. Keep antifreeze locked up and far out of the reach of curious pets. 5) Play inside – When the “wintry mix” is into its 3rd day, or your pet isn’t one who enjoys the cold, warm up inside. A rollicking game of “hide and seek” will warm you both up. Just make sure you take a few minutes to move delicate furniture or breakables out of the way.